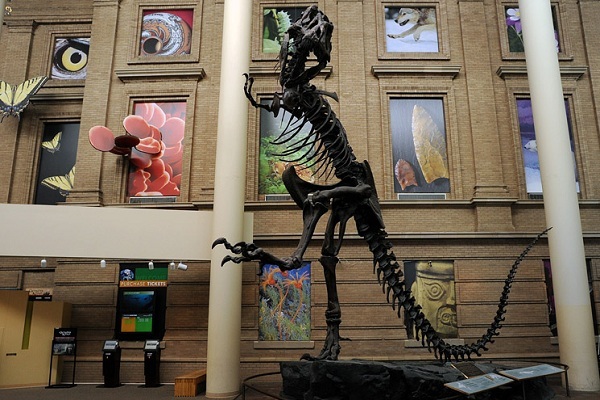 Founded in 1900, the Denver Museum of Nature & Science traces its origins back more than a hundred years to one man's efforts and a little log cabin tucked away in the mountains. In 1868, pioneer and naturalist Edwin Carter arrived in Breckenridge, Colo., and devoted himself to his true love-the birds and mammals of the Rocky Mountains. Carter soon assembled one of the most complete collections of Colorado fauna and displayed his specimens in his log cabin home, dubbed the Carter Museum. As word spread of the Carter collection, the need became apparent for a larger fireproof building to preserve and display his growing natural history collection. Funds were soon raised and The Colorado Museum of Natural History (now Denver Museum of Nature & Science) was incorporated on December 6, 1900. The collections were soon enhanced with crystalline gold specimens from John F. Campion and butterflies and moths from John T. Mason. A new building in Denver's City Park was completed and opened to the public in July 1908. Over the years the Museum has expanded with the addition of Phipps Auditorium (1940), Gates Planetarium (1968), an IMAX theater (1983), a major 187,000-square-foot addition in 1987, and the Leprino Family Atrium and Anschutz Family Sky Terrace (2002). Today the Museum continues to evolve, expanding in both size and breadth of activities, as our exhibits, programs, research, and collections continue to offer opportunities for discovery.